If you are running third party visual basic products, they can potentially cause conflicts with our programs. 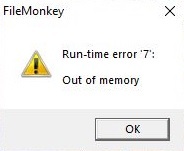 One such problem would be an error on launch "Run Time Error 7, Out Of Memory"
Typically, this problem is mostly encountered on machines that have recent installs of Microsoft Office. Office incorrectly registers various visual basic modules on install. Firstly, you will need to identify which module is conflicted. For our products, this will almost always be the module "mscomctl.ocx"
Next, you will have to unregister all versions of this module on this machine and then re-register the module. This should hopefully fix the issue. regsvr32 /u "C:\Program Files (x86)\FileMonk\mscomctl.ocx"
Note, that we are attempting to re-register the module:  "C:\Program Files (x86)\FileMonk\mscomctl.ocx" which will typically come with our product, filemonkey. Try running filemonkey in compatibility mode. To do this, right click on the filemonkey icon. Select "properties" then select the "compatibility" tab. Tick the "run this program in compatibility mode for:" tick box and select "windows xp sp3" from the drop down menu. Note that this operation might take some time. It basically checks that your system files are valid. Or message us and we will investigate further.